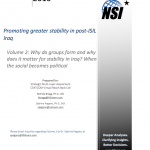 Promoting greater stability in post-ISIL Iraq, Volume 2: Why do groups form and why does it matter for stability in Iraq? When the social becomes political. United States Central Command (CENTCOM) posed the following question to the Strategic Multi-layer Assessment (SMA) virtual reach back cell: What opportunities are there for USCENTCOM to shape a post-ISIL Iraq and regional security environment, promoting greater stability? To address this question, in volume 1, we examine the drivers of legitimacy, security, and social accord for key Iraqi stakeholders. 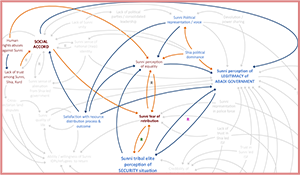 In the current volume 2, we provide an in-depth and comprehensive discussion of the key social elements and dynamics contributing to social accord, and tie the social domain to the political domain in Iraq, with accompanying implications for stability.